Book a skilled gutter cleaning expert in Albuquerque. Backed by a total satisfaction guarantee and amazing customer support. There is more to Albuquerque than just hot weather and vast desert landscapes. The largest and most populated city in New Mexico has a lot to offer both tourists and locals alike. If you want good food, just head over to Farm and Table or Antiquity Restaurant to enjoy some good, old New Mexican cuisines. 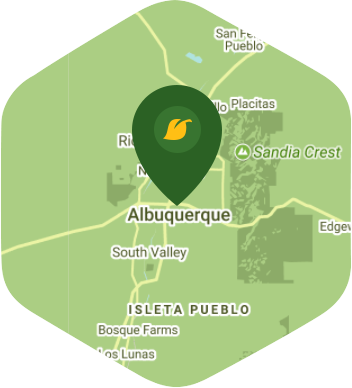 If enjoying nature is your thing, then there's always Loma Del Norte Park and the Albuquerque Botanical Garden. The green spaces in Albuquerque are some of the most beautiful in this side of the country, and they are truly worth exploring. However, your gutters need cleaning, so your plan of visiting one of its parks is going to have to wait – or does it? With Lawn Love's gutter cleaning service, you won't have to cancel your plans this weekend. Let one of our reliable lawn pros do the messy work for you because they know how to deal even with the messiest of gutters. With our guys on the job, your gutters will be free of most of the dirt and debris messing them up. Setting up an appointment with one of our gutter cleaning experts is easy thanks to our online app and website. Why wait for your gutters to become more messed up? Give us a call at 505-207-4954 or ask us for a free online quote. We'd be happy to help you. Here are some average lawn care prices for homes in Albuquerque. Average lawn size 3,780 sq. ft.